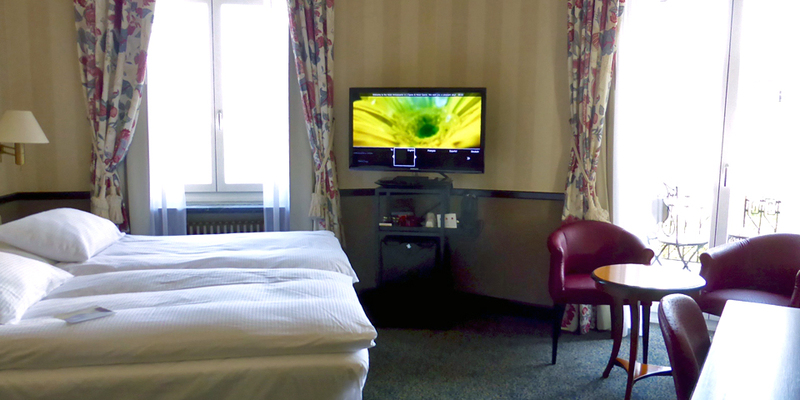 We ended our trip to Switzerland with an overnight stay in Zurich. By choosing centrally located accommodations we made the most of our 24 hours to enjoy the best of what the city has to offer. We walked to most of the places of interest and had a room with a great view where we could relax and enjoy our stay in comfort before flying home. The neo-baroque style Hotel Ambassador à l’Opéra is a 45 room Small Luxury Hotel in the former Uto Castle. We were given a voucher for a glass of champagne at check-in that we enjoyed later. Our room overlooked the lake, the steeples of the city’s three iconic churches, and the Opera House that was built in 1891. There was also a rooftop terrace designed for relaxing with the view of the lake and Alps. We were by the lakeside promenade and near the ticket office for lake cruises. 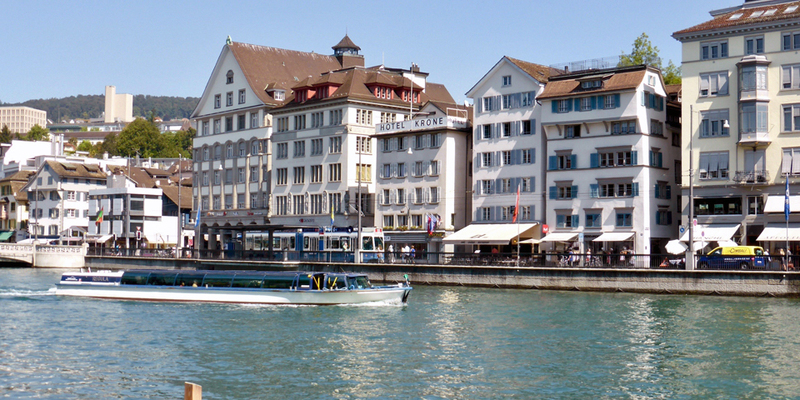 It was a short stroll to the Limmat River, which flows from the lake and where low boats shuttle passengers throughout the city. 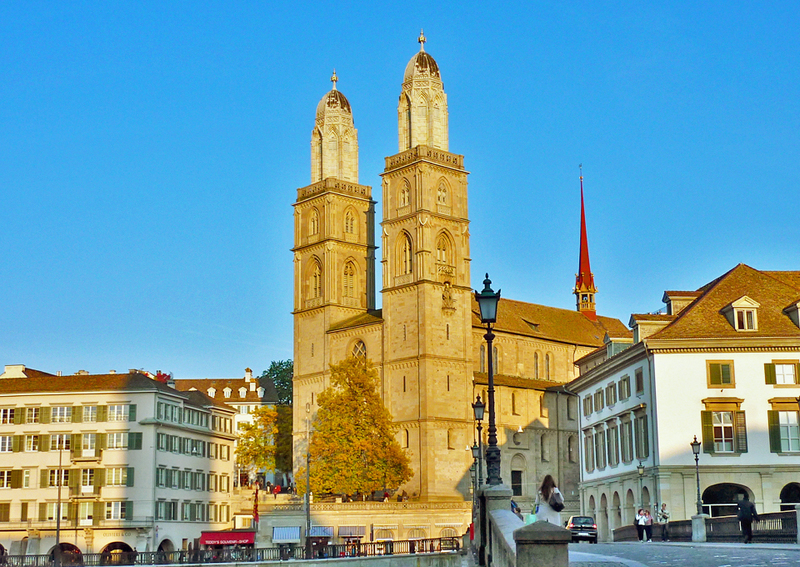 The landmark Grossmünster, the “Big Cathedral” is where Huldrych Zwingli and Heinrich Bullinger led the Swiss Reformation in 1519. It is said that after Charlemagne found the graves of patron saints Felix and Regula here he had the church built as a monastery. The bronze doors, stained glass windows, and cloister are worth a look. Fraumünster is renowned for its and Giacometti and Chagall stained glass windows. It is on the grounds of an abbey founded in 853 by King Louis the German for aristocratic European women. St. Peter’s Church, the oldest parish church in Zurich, still has remains of the original 9th century foundation walls. It is easily recognized by its 28.5’ diameter clock face — the largest in Europe. 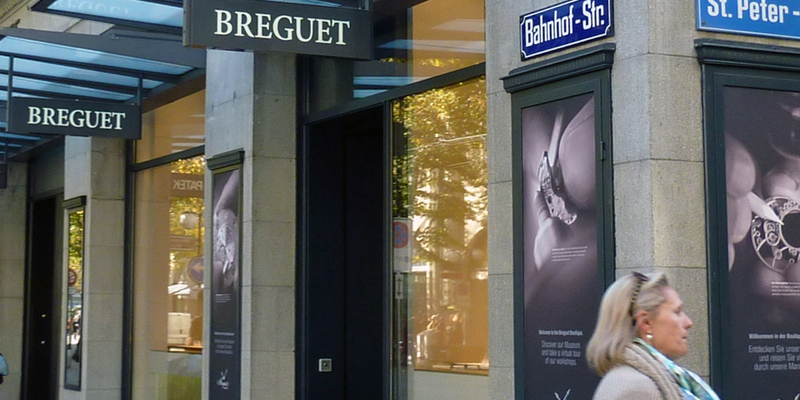 Bahnhofstrasse, the mile-long shopping street that runs from the train station to the lake, is renowned for its elegant shops with luxury products. 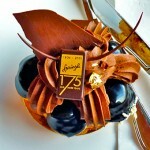 On a previous visit, we stopped there to savor the elegant cakes, chocolates, and signature macaroons known as Luxemburgerli at the stylish Confiserie Sprüngli on Bahnhofstrasse. 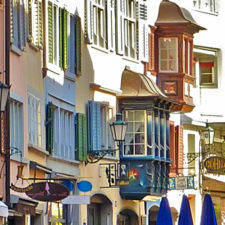 We opted this time to stroll along the winding lanes and alleys of Altstadt, the Old Town, an area that attracts both locals and tourists by day and night. Its medieval buildings have been restored and transformed into unique little shops, restaurants, cafés, and galleries. During the turmoil of World War I many found asylum in neutral Switzerland. 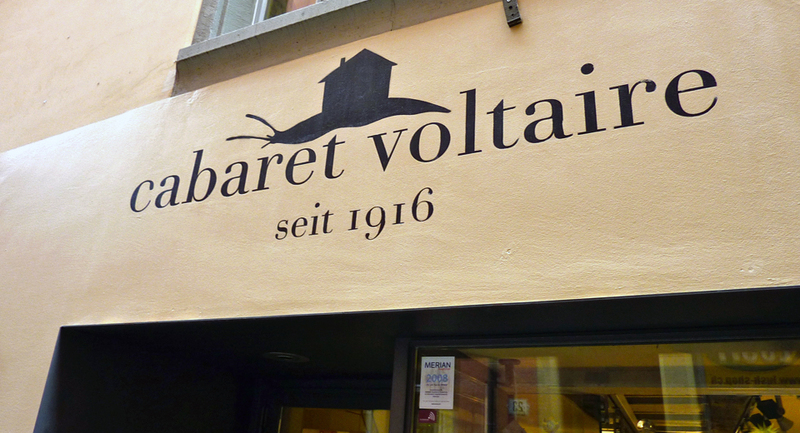 Cabaret Voltaire on Spiegelgasse was the hub for émigré artists and writers. In 1916 Zurich was a birthplace of the revolutionary art and political movement known as Dada that evolved as a response to the atrocities of war. Cabaret Voltaire honored Dada’s past when it reopened as an art institute in 2004 stressing independence and resistance through avant-garde performances, debates, and workshops. 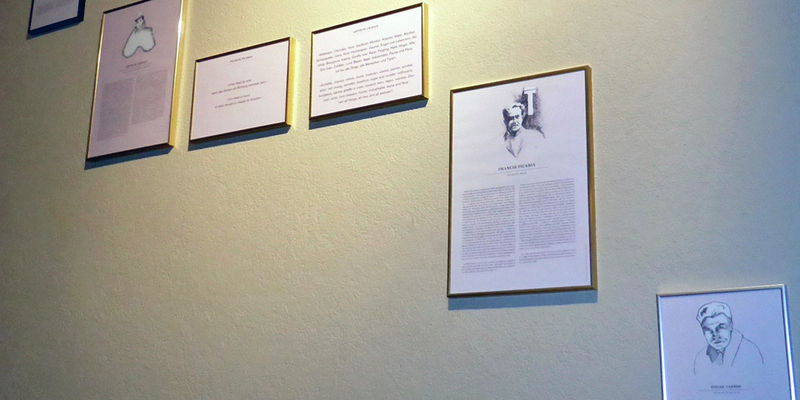 For the 100th anniversary of the movement the Hotel Ambassador joined Cabaret Voltaire in celebration by displaying hand-drawn portraits of the most significant Dada artists and “Super-Dadaists” like Einstein, Lenin, and Freud. 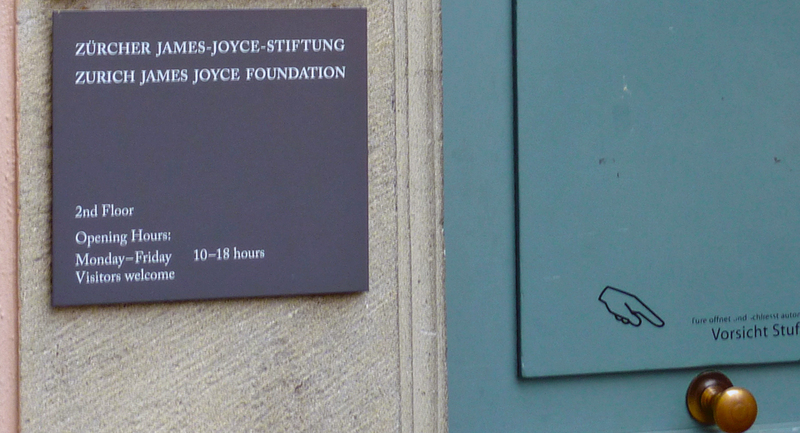 A plaque marks one of the places Irish poet and writer James Joyce lived while working on his novel “Ulysses.” The James Joyce Foundation, established to keep his memory alive, is on Augustinergasse 9. Another plaque at Spiegelgasse 14 marks the place where Bolshevik leader Vladimir Lenin lived from 1916 to 1917. It was a day of record-high temperatures. To escape the heat we thought about revisiting the fairytale-style castle that houses the Swiss National Museum’s vast Swiss cultural history collection. We thought of going to the top of Zurich’s local mountain, Uetliberg, to await the sunset view of the city and lake. But after walking all morning we did what the Swiss do on a hot day and headed for the lake. 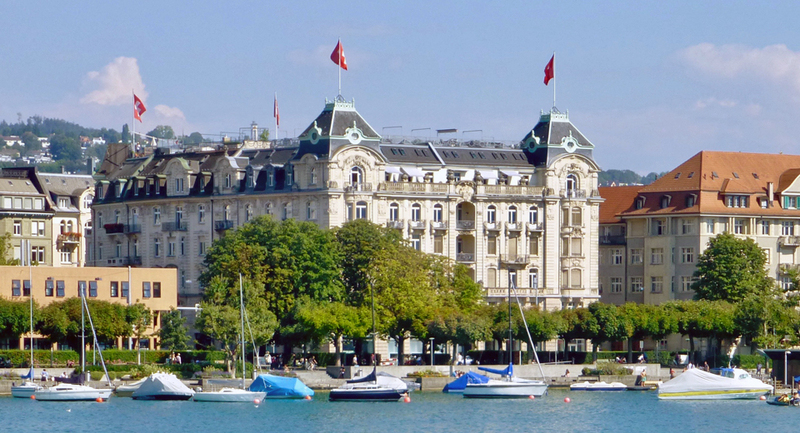 We relaxed with a cruise that was included with our Swiss Travel Pass. A 1 1/2 hour trip was also available but we arrived just in time for the 4 hour Long Round Trip. 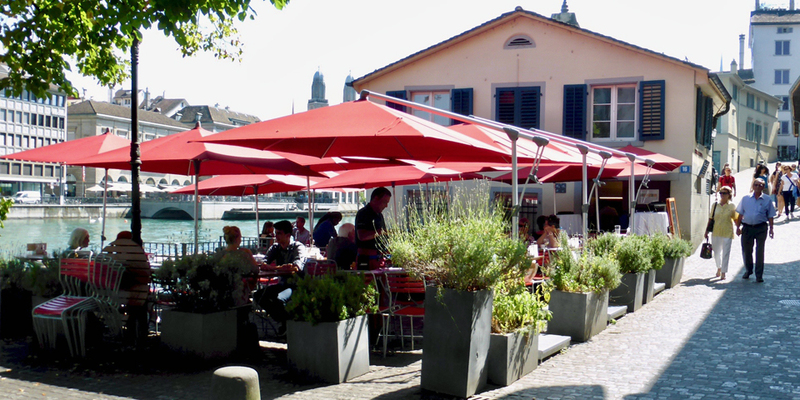 It makes stops along both sides of the lake as it runs between Zurich Bürkliplatz and the medieval town center of picturesque Rapperswil, known as “Town of Roses” for its many gardens. Rapperswil’s 12th century castle, which now houses the Poland Museum, looms above a variety of attractions, including a vineyard, Capuchin monastery, and garden. Families flock to Circus Knie’s Children’s Zoo, a popular stop for both locals and visitors. Rapperswil has a 2700’ long pedestrians bridge across the lake to the village of Hurden. It is the longest wooden bridge in Switzerland. The cruise brochure offered helpful information about sights along the way and noted stops that had lakeside restaurants, public beaches, children’s playgrounds, museums and campgrounds. 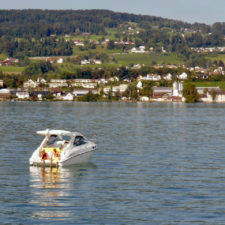 We noted that we would be able to see the Lindt & Sprüngli chocolate factory in Kilchberg from the lake. 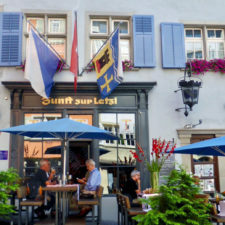 We learned that there are restaurants and shops in the preserved historic village center of Richterswil. In the 19th century it had a textile mill, brewery, and a brick factory. At noon on Sundays, the highest gravity-powered fountain in the world, built by a mill owner, gushes to a height of 331’. A chapel and the Old Knight’s buildings are right by the pier in Uerikon. The knight’s house from 1531 is a national landmark. Vineyards in Meilen date back to the 14th century. The well-to-do built lakefront country estates like the 17th and 18th century Schipfgut, in Herrliberg. It was the summer home of a family who made a fortune in the silk trade. 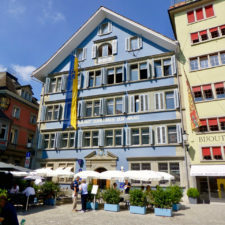 Goethe and Winston Churchill stayed there. 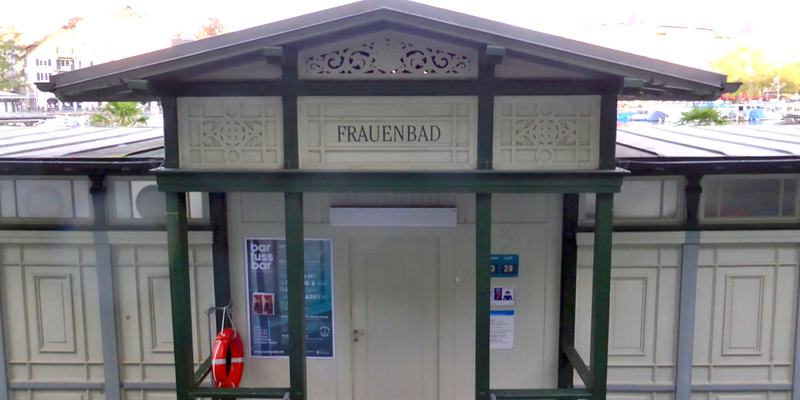 We also passed the turreted Traubenberg, “Grape Hill,” built in Zollikon for Hans Caspar Escher. 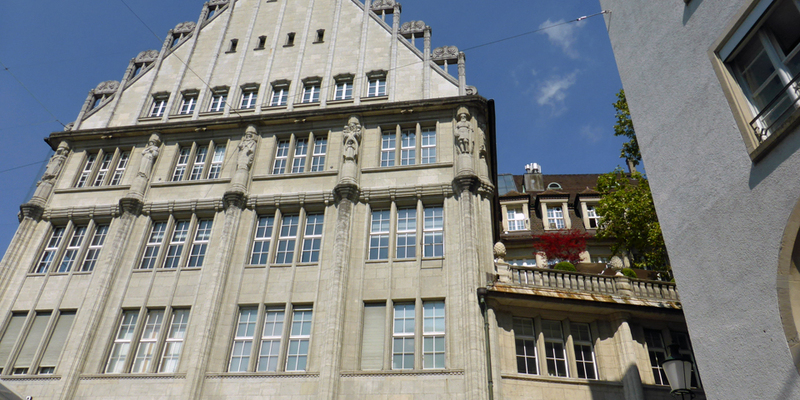 He was the 17th century mayor of the city and Republic of Zurich. If we had more time we would have stopped for a coffee at one of the many lakeside cafés and explored some villages. Maybe next time. 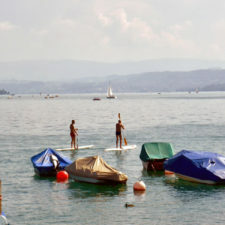 As the afternoon progressed, there were more and more people outdoors, on boats, at the beaches, and paddle boarding. 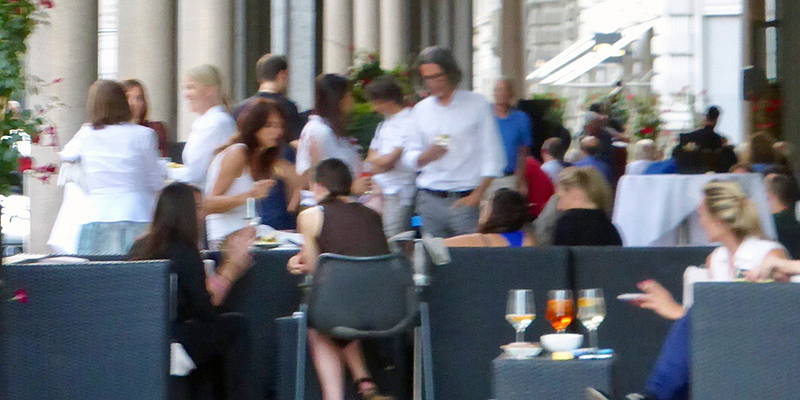 When we returned to Zurich, we strolled past the Börse area, where stylishly dressed young professionals were sipping cocktails at outdoor tables at a chic café. 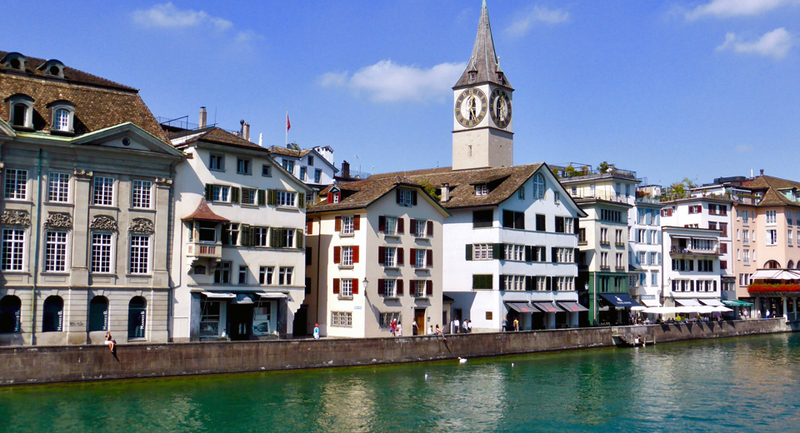 Zurich’s water is so clean that people can jump right in for a swim. 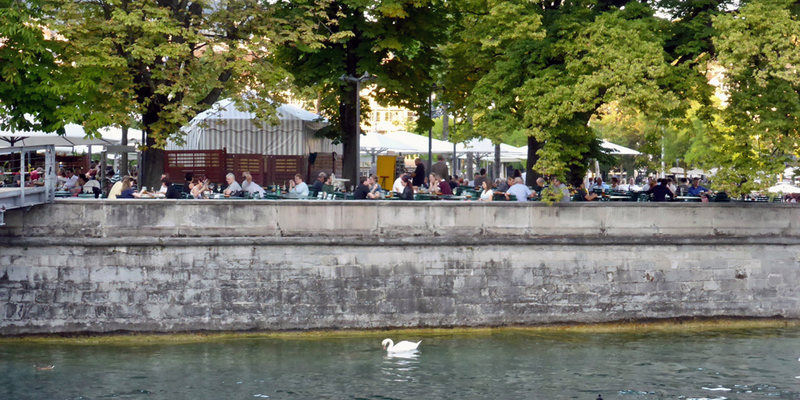 The Art Nouveau style Frauenbad Stadthausquai is one of the city’s public swimming areas that is transformed into a bar and lounge after dusk on summer nights. We walked back along the lake promenade past the Pavilion of Reflections, a floating wooden platform was a hub of activity during our stay. It was part of Manifesta 11, a 100 day biennial celebration that explores social changes in the European cultural landscape. 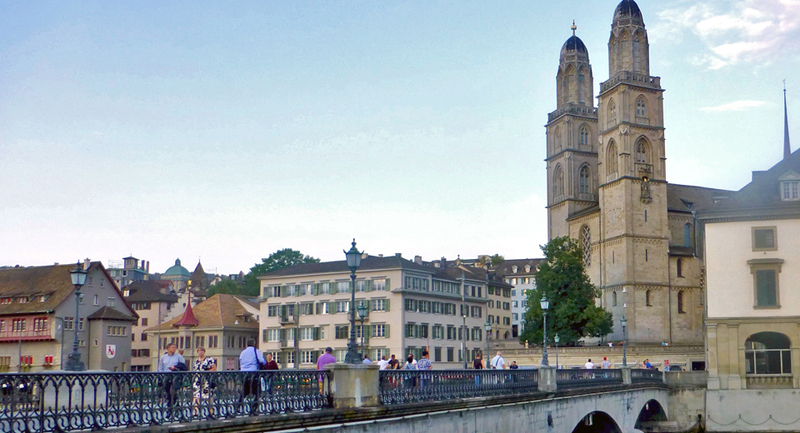 Artistically and intellectually liberal Zurich was a perfect choice as host city in 2016. 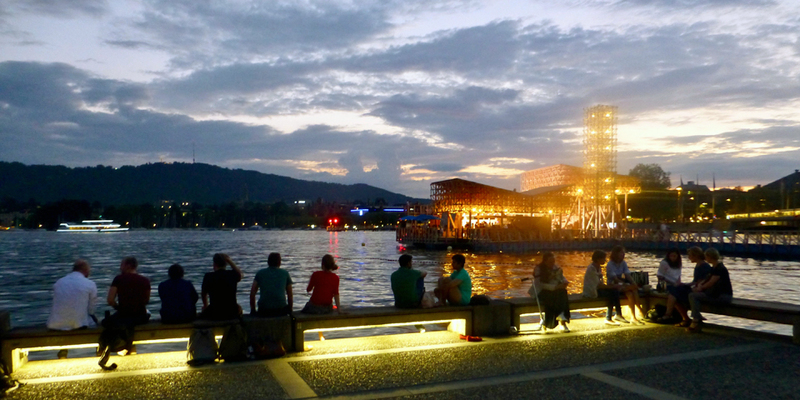 This urban island was the product of a competition among architecture students. It was designed to be a gathering place with artwork and open-air swimming by day and films by night. 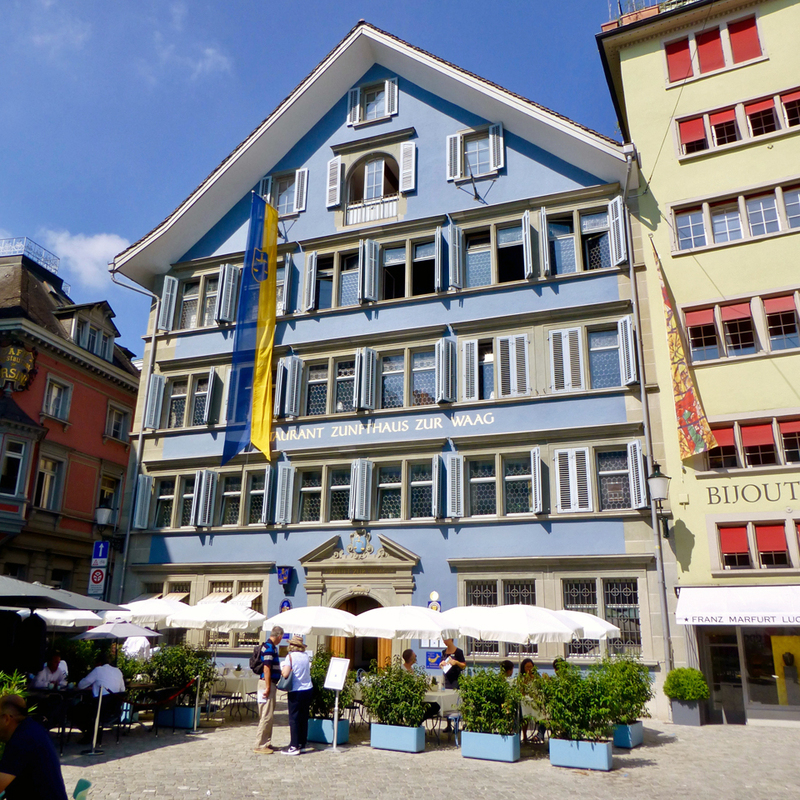 We returned to our hotel to dine at the Restaurant Opera, which has been awarded Gault Millau points and the Golden Fish for their specialties. This intimate restaurant is decorated in surrealistic baroque images of the opera world. 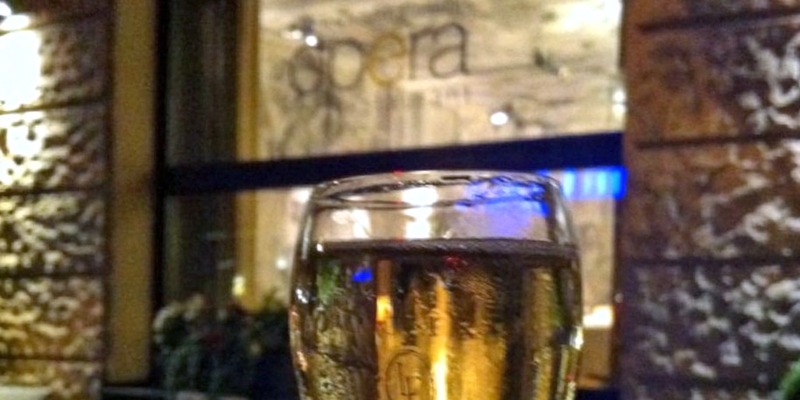 We ended our evening with our complimentary champage on the boulevard terrace. We relaxed with the nighttime view from our balcony then closed the motorized shades to block any light or sound. We had chosen goose down pillows scented with lavender from the pillow menu. We settled into the plush electronically adjustable bed to enjoy a rejuvenating night’s sleep and sweet dreams of our Swiss adventure. Want to walk in the footsteps of the intellectual, political and the social elite? 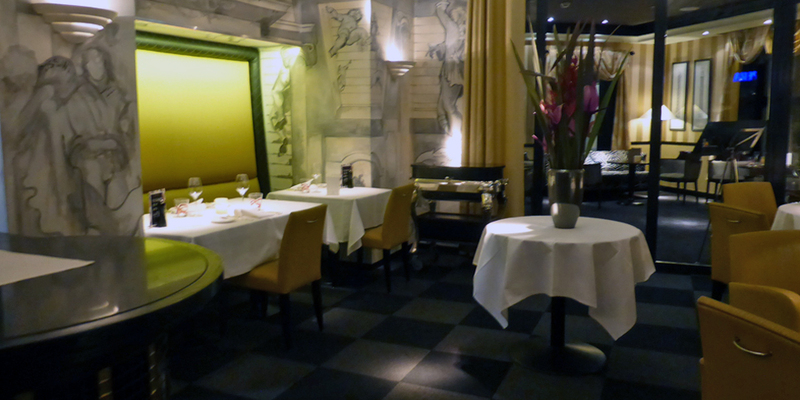 Dine in a Viennese-style coffee house with grand chandeliers and marble walls. 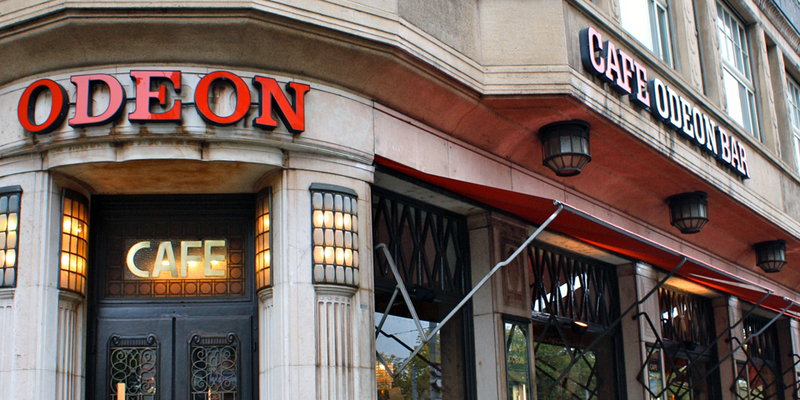 The Art Nouveau Odeon is a café, restaurant, and bar that teems with a history and goes back to the origins of Dadaism. Einstein met with students from the Swiss Federal Institute of Technology here. 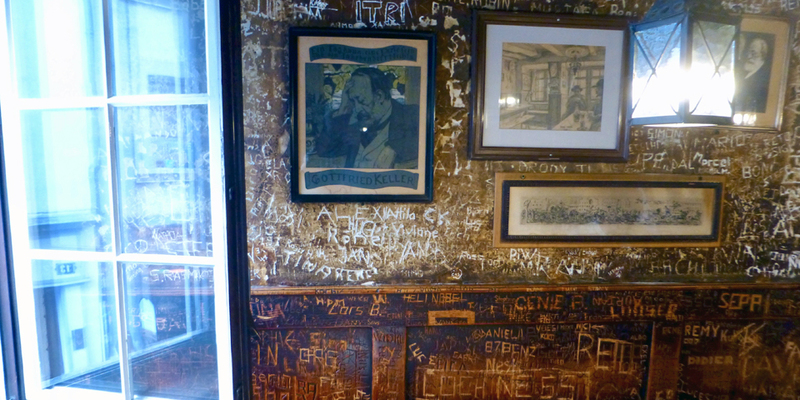 Lenin, Mussolini, and Trotsky were among the regulars. Vegetarian? 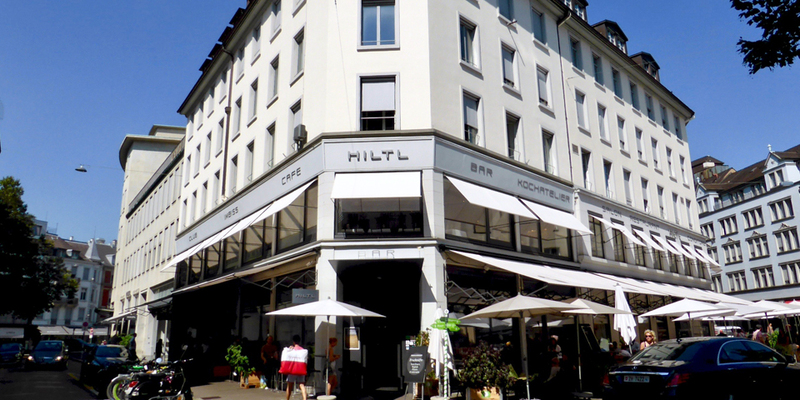 Haus Hiltl, the world’s oldest vegetarian restaurant, is known for its buffet. It was founded by Ambrosius Hiltl who had rheumatoid arthritis and was told to avoid meat. Looking for a hidden gem? You will need a reservation for a table on the terrace of the café upstairs in Grieder, the exclusive department store known for luxury fashion. Try the Fruchtwähen, a fruit dessert traditionally eaten on meatless Fridays. 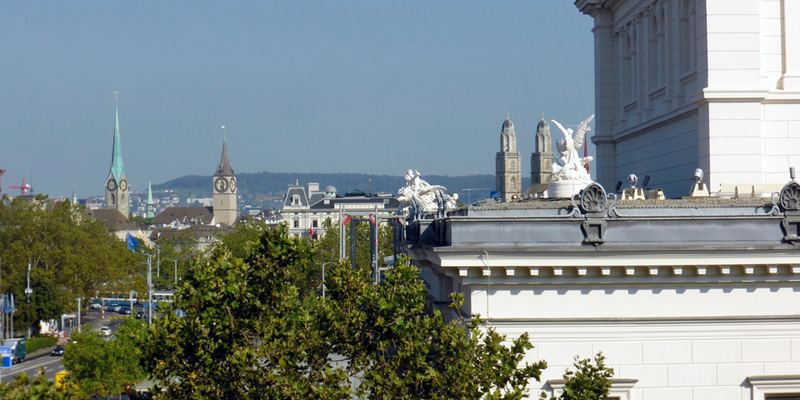 Look up to see a hidden gem of a restaurant on the terrace of the luxury department store, Grieder. Like to immerse yourself in history? 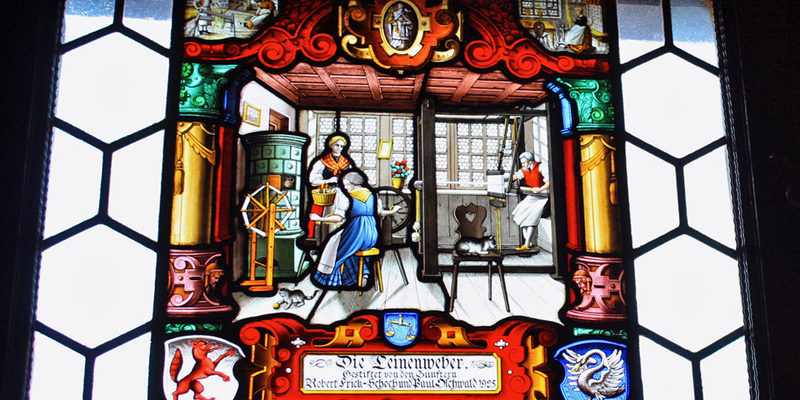 There is a view of Fraumünster church and Münsterhof Square through the colorful stained glass windows. Want to try for beer on the house? You will have to crawl between beam and ceiling in the upstairs front room at Oepfelchammer. 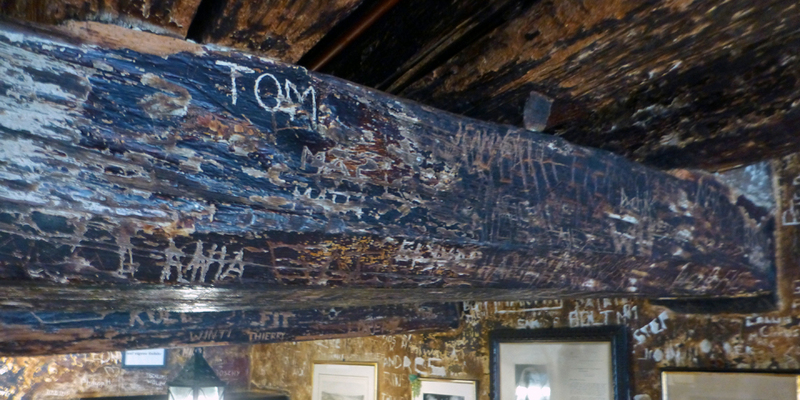 It is fun to read the inscriptions carved into the walls and tables in this 200 year old building in the Old Town. Want to help support people trying to return to the work force? Schipfe 16 is a restaurant that offers job training in this former soup kitchen. 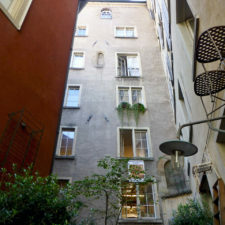 It is in the old Roman part of the city on a narrow riverside street that is known for its artisans. Don’t have a Swiss Travel Pass? Save time and money with the ZürichCARD, good for 24 or 72 hours. It is available online or at Tourist Information at the airport and main train station and all ticket machines of the Swiss Federal Railways (SBB) and the Zurich Transport Network (ZVV). It includes unlimited 2nd class transportation by bus, train, tram and cableway in the city and surrounding area, including Uetliberg viewpoint and the ten minute train ride to the airport. There is free admission to most museums, a half-price city tour and other discounts in restaurants and on concerts, shows, opera, hip clubs and other activities. 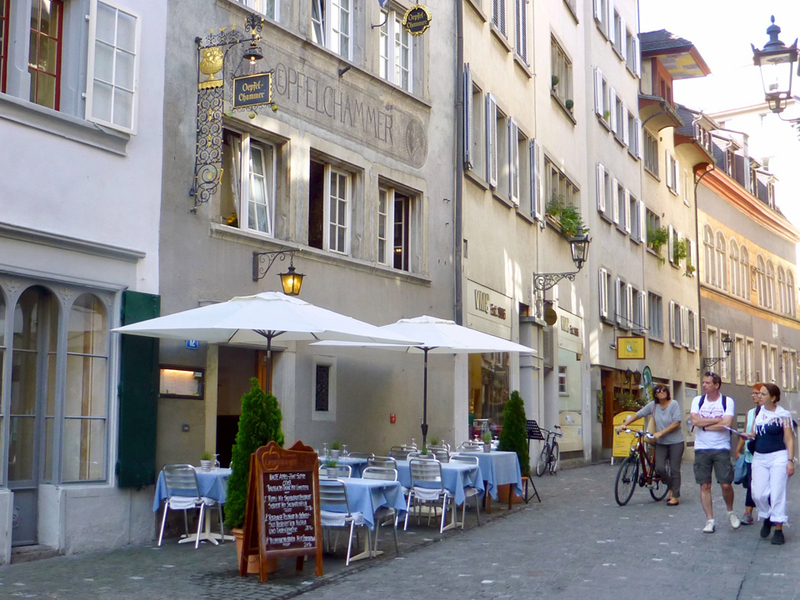 Wonderful post about Zurich, Linda! Definitely makes me want to go back to this vibrant city! I’m glad you got to visit Sprungli! 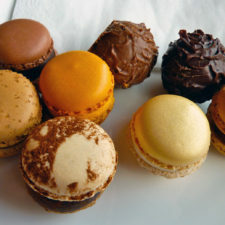 It is such a delicious diversion. Yes, Doreen, a trip to Switzerland is not complete without some chocolate. And what a selection in Zurich!